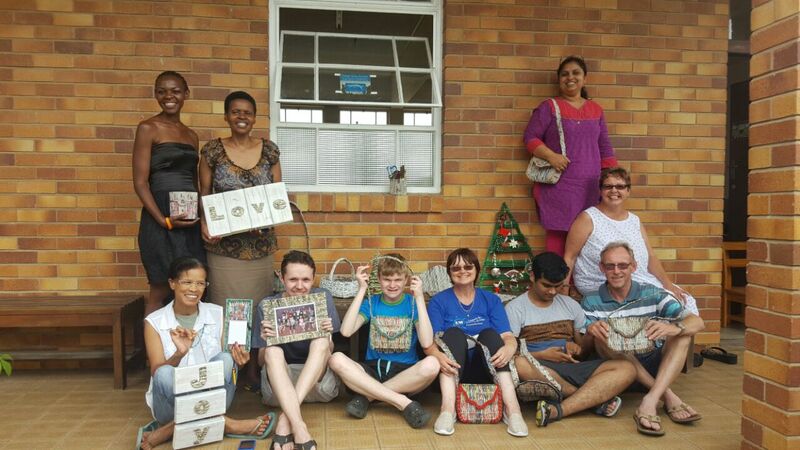 There’s a newspaper craft group which meets every Saturday at Sinethemba School for Autism in East London. This group, however, is comprised of young adults, all of whom have autism. 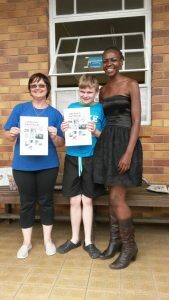 The group was started when Antoinette Bruce Alexander, Autism South Africa’s Regional Development Officer for the Eastern Cape, mom to an 18 year old young man with autism, and also owner of the Sinethemba School for Autism in East London, came to the Johannesburg School for Autism and saw the beautiful newspaper crafts that had been created by the students at the Johannesburg school. 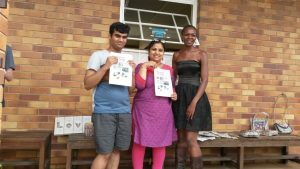 Antoinette contacted Lungi, who runs all the training, and Lungi was soon flying down to East London on Saturday mornings to train Antoinette, other parents as well as the young adults. Their training lasted for 4-6 hours on a Saturday – this took four months. The group getstogether every Saturday afternoon at Autism Sinethemba (Antoinette’s pre-school for children with autism) where they sit and create their beautiful creations. The number of young adults and their parents or care givers have grown over the last year and the hope is to expand the group to help more young adults to learn new skills and through their own work, earn money. The aim is to make them as independent as possible. 90% of money made goes to the young person who made the article that was sold, 10% comes back to the project for buying more supplies or paying for our stall at any market (normally a charge of R100.00). 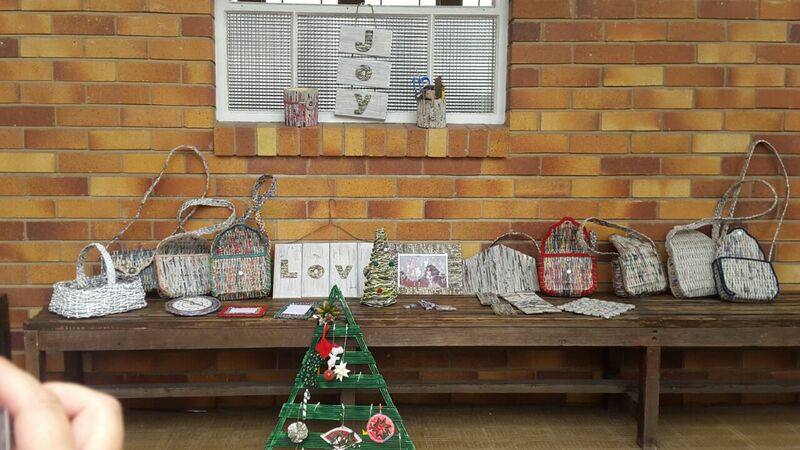 At the end of last year, they hosted their first stall at the Maren Oppie Plaas market. The market last year was not as successful as the group had hoped for, however it was their first one and some valuable lessons were learnt. “The market in December was not very well attended, there was a lot going on in East London at the time and being two days before Christmas, it was relatively small with only a few bags and goodies sold. It is a new experience for all of us and I am sure we will do much better in future. It was also an afternoon/evening market, we needed to take little lights to light up our stall and by 4:30 the weather closed in and the rain started, then everyone packed up and left. It was miserably cold and wet. We cannot do anything about the weather, so we said goodbye to the market and we will try again with a few markets this year.